I am trying to install a graphics card into my PC Nvidia GeForce GTX 1050 Ti 4GB I opened up the PC and it slotted in nicely but then it has an extra power cable, so the six pin plugs into the graphics card but then it had a molex connector to plug into the computer. 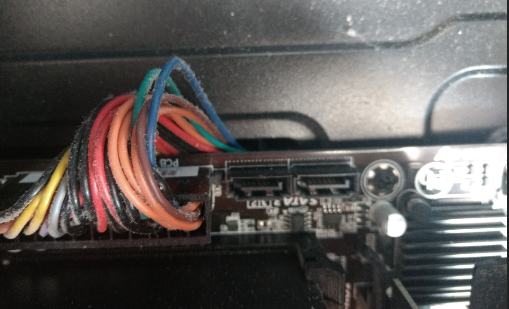 I don't have anywhere to plug in a molex connector so wondered if I need a sata cable but I am not really sure. I have attached a picture of inside of my computer and wonder if anyone can help me and tell me how I can upgrade the graphics card and what power cable I need.Thanks Not sure how to add pic, maybe someone can help? Unfortunately we cannot see the picture. you will probably need some form of adaptor cable to plug a spare power cable from the PSU into your molex connector. is what I assume you have to plg into your card - does the PSU have one of these so you don't then need then one with the molex? I have the six pin that is shown in your picture, but not sure what end I should have that fits into the computer. I am not sure how to put a picture in here. The picture shows what it should plug into when in the computer. The graphics card fits in fine and the six pin goes into the graphics card but just can't work out what end I need to fit on the computer. Thanks. Yo are showing a picture of SATA data ports on the motherboard - these do not provide power. Look at your Power supply unit and see what spare cables you have coming from that. OK great I will do that. Thanks so much. By the way do power supplies usually have extra wires as it might be that it doesn't? Yes they often have spare cables so you can add extra drives or other equipment. You can buy splitter cables to power two things from the same connector if required. All this sets me to thinking. Do you know that your Power Supply is sufficiently robust to power this Graphics Card? What is it's Make and Model Number?